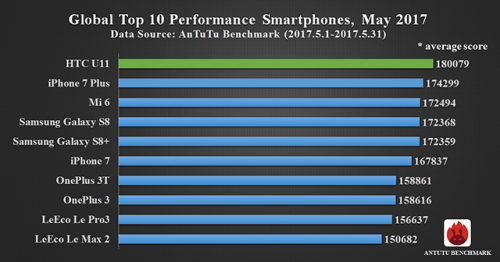 The Android flagship scored 180079, while the iPhone 7 Plus got only 174299. The reason for weaker performance is probably somehow connected with the release of iOS 10.3.2. Since the figures for June are not ready yet, the HTC U11 remains the most powerful smarphone that is currently available for purchase. Along with the iPhone 7 Plus, the smaller iPhone 7 has lost its position, losing to the Xiaomi Mi 6, Samsung Galaxy S8 and the Galaxy S8+. In real life, however, iPhones work smoother and are generally faster in opening apps and completing day-to-day tasks.